A while ago I had written a post explaining difference between SaaS, PaaS and IaaS. In PaaS if you see examples IBM Bluemix is one of the PaaS solutions. In this post we will explore it in detail. Bluemix is powered by Cloud Foundry open source project which itself is a PaaS solution. Once you have the Dashboard you are all set to create and deploy App of your own. Go ahead and Click on Create An App. You will be prompted to choose what type of App are you creating ? Is it a web app or a mobile App? For this demo tutorial lets select web app. For this demo I am choosing NodeJS as it will be easier to demonstrate final outputs. Choose SDK for Node js and click continue. Put some name. I had put DemoWebApp but unfortunately it was taken. So I have put it as DemoTestWebApp. We will see it is next screenshots. Anyway click on finish and your template App should be created, built and deployed. Let see how it looks like, shall we? If you see start coding section under dashboard you should see various methods in which you can build your code. Download and install CF CLI from here. I am using Windows. You can choose installer which suits your requirement.... Debian, Redhat, Mac OS X, Windows etc. Next Download the template code. Link to it should be in the same CF CLI section of Start coding section. Go ahead and download the zip file (DemoTestWebApp.zip in my case) and extract it. Lets make some changes to the code now. Example code makes use of Jade Node template engine. The pages that are rendered are in views folder of extracted folder. //- This file provides the HTML body part. p This is a demo web app created with <span class = "blue">NodeJS Starter Application</span> by <span class = "blue">Aniket Thakur</span>. Happy Coding! This means your code is deployed and your app is restarted. All you have to do now is revisit your App URL and test out the changes. Lets say you are designing a system to process stock rates that you receive from stock exchange. Lets say you develop a web application that expects a JSON object. Maybe in further processing down the workflow some other format is expected. To integrate various such services and inter communicate in platform independent way SOA is used. SOA suites provides easy way to integrate such services. 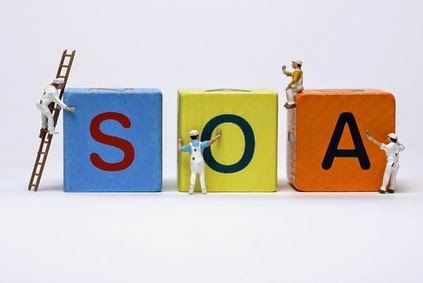 SOA is service oriented architecture. 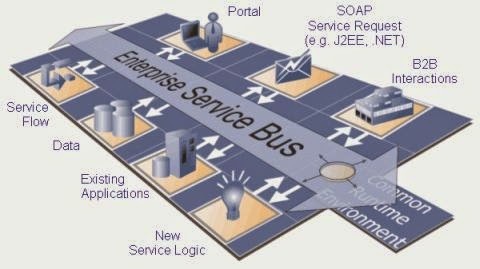 In SOA services are decoupled and can interact with each other irrespective of the service type. Meaning a particular service can be platform or protocol specific but SOA enables such services to interact and exchange data. 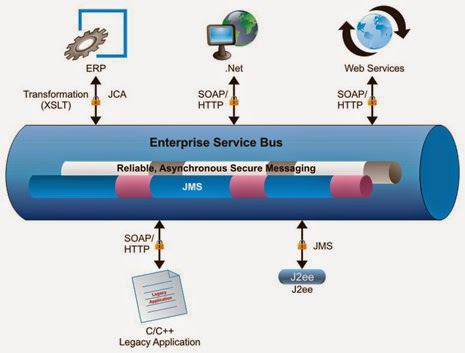 This data is essentially exchanged via ESB (Enterprise service bus) which forms the backbone of any SOA architecture. Let me go ahead and give specific example to help understand this better. One way ESB could be implemented us by using JMS servers and using XML/XSD as means of transferring data between various services. So various service will register or connect to these JMS servers and exchange data using XML format. Generally SOA suite comes bundles with so called adapters that help transforming messages to and from format understood by service and XML. For example consider shares trading system. Messages from stock exchange come in FIX protocol. You may have build an application that expects JSON. To make these both systems work you will use SOA - FIX Adapter will convert FIX message to XML, then this xml will be transferred to JSON Adapter over ESB which will then convert to JSON as required by your system endpoint. Note : I have mentioned XML as it is platform independent message format. It is in fact SOAP (Simple Object access Protocol) that is used to transfer messages. SOAP is a standardized xml with already defined and recognized specifications. Finally hoping following picture makes it very clear.